What’s more American than apple pie? Nothing, that’s what. So naturally, when I learned about All Through the Year Cheer’s Fourth of July contest, I just knew I would bake an apple pie. I mean, come on, the all-American dessert on America’s birthday… how perfect is that?! Just imagine that an apple crumb pie and a batch of brownies had babies. You would get these Apple Streusel Bars: apple pie goodness in a tote-able bar form. 1. Place rack in the center of the oven and preheat to 375°. Lightly spray a 12×18 inch jelly roll pan with vegetable oil. 2. To prepare the crust, cream together butter, cream cheese and brown sugar in a medium sized bowl. Beat in the egg and vanilla. Stir in the flour and salt until blended. 3. Using your fingers, press the dough into the bottom of the pan to form an even layer. 4. To prepare the filling, in a large bowl mix the flour, sugar and cinnamon. Add apples and toss to coat. Layer the apple mixture in the pan to form a layer on top of the crust. 5. To prepare the topping, in a small bowl mix the flour, sugar and cinnamon together. Cut in the butter until the mixture forms crumbs. Evenly sprinkle the crumbs on top of the apples. 6. 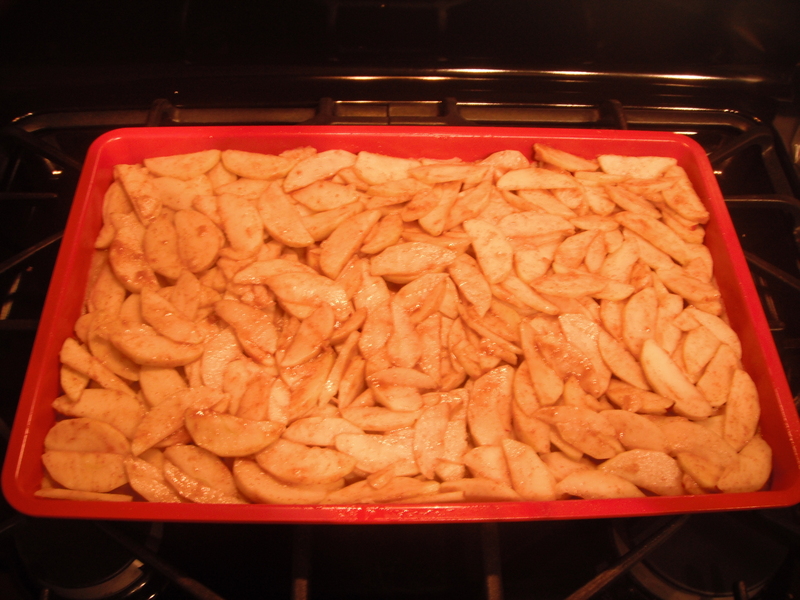 Bake for 40 minutes or until the apples are tender and the top layer is golden brown. 7. Cool in the pan. If not serving right away, store in a cool place for up to 24 hours. 8. Cut sheet into bars just before you are ready to serve. Yields about 24 large bars or 30 smaller bars. These Apple Streusel Bars will be an absolute hit at any Fourth of July BBQ. And since they’re bars, they are easy to transport. Just note that if you are bringing them somewhere, I would recommend putting a layer of saran wrap or parchment paper between each layer of bars to avoid the crust absorbing the moisture from the apples and turning into mush. Pack them up and go… just try not to eat them all before you get there!